Brokerdealer.com blog update courtesy of MarketWatch’s Craig Stephen. Some brokerdealers are still recovering from the shock they received last week, when the National Swiss Bank unexpectedly announced on Thursday that they would be scrapping a three-year-old cap on the franc. Now they are trying get ahead of the curve and are predicting that China’s yuan will be the next shoe to drop, so to speak. The surprise move by Switzerland to scrap its currency ceiling against the euro EURCHF, -0.94% last week is a reminder there can be unexpected collateral damage from central banks waging currency wars. As markets digest last week’s turmoil, expect focus to turn to other fault lines on the global currency map. Here China stands out, as like the Swiss, it runs an implicit currency peg that is becoming increasingly painful to maintain. Due to its longstanding crawling peg to the U.S. dollar, the yuan USDCNY, -0.21%USDCNH, +0.00% has increasingly found itself pulled higher against just about every major currency. The world’s largest exporter has already had to endure two years of aggressive yenUSDJPY, +0.85% devaluation since the introduction of Abenomics and its accompanying quantitative easing. Now comes a new front, as the European Central Bank (ECB) looks ready to green-light its own QE next week. The move by Switzerland also means the Swiss National Bank (SNB) ceases its purchases of euros needed to maintain its peg, again meaning the euro will all but certainly head lower. Further currency strength is likely to be distinctly unwelcome for the Chinese economy. Later this week, gross domestic product figures for 2014 are widely expected to show growth at its slowest pace in 24 years if, as some predict, the government’s 7.5% annual growth target is missed. This comes at the same time that the economy is flirting with outright deflation and amid a new trend of foreign capital exiting China. Last week’s currency ructions present a new headwind to growth as exports will be harder to sell across Europe, China’s second biggest market after the U.S. The other danger looming for China is that a strong currency exacerbates deflationary forces. Producer prices have been falling for almost three years, and the plunge in crude-oil prices adds a further disinflationary bent. The property market looks as if it could also push prices decisively lower. Prices of new homes in big cities fell 4.3% in December from a year earlier, according to new government data released over the weekend. The difficulty for Beijing is that these external movements in currencies are outside its control. If moves to depreciate the euro EURUSD, -0.38% trigger another round of competitive deprecations, just how much more yuan appreciation can China withstand? While the policy actions of both the Swiss and European central banks last week appear quite different, they share a common feature: Both acted with reluctance only when the pain became too much to bear. The reason deflation is public enemy No. 1 for central banks is that debt becomes much harder to service and can stall growth and employment as consumers put off purchases and business put off investment. China certainly has debt levels that would make deflation worrisome. Total debt levels are now estimated to be in excess of 250% of GDP. Lower-than-expected bank loan growth in December also suggests demand in the economy is already weak. The other area to be concerned about is capital flows, as investors remove bets on further yuan appreciation. In recent quarters, we have seen signs of hot-money flows exiting China and foreign-reserve accumulation reversing. 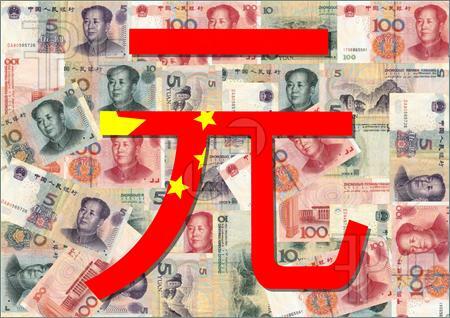 Fourth quarter 2014 figures showed that Chinese forex reserves declined by $48 billion to $3.84 trillion. This could reflect both a forex-valuation effect and capital outflows with the euro and yen depreciating by 4.2% and 9.3%, respectively, against the dollar during the period, according to Bank of America data in a recent note. Outflows widened to $120 billion in the fourth quarter from $68 billion in the third quarter, Bank of America said. Meanwhile there are already signs liquidity is tightening. Latest figures show China’s money supply contracted in December, with M2 growth slowing to 12.2% from 12.3% a month earlier. Bank of America notes that M0 — the most narrow measure of liquidity — has been growing very slowly due to slumping foreign-exchange purchases by the People’s Bank of China (PBOC). This combination of money outflows and tighter liquidity shows the challenge facing the PBOC. If capital outflows were to accelerate, it will need to use up more of its foreign-exchange reserves to maintain its currency peg. This will reduce liquidity, unless the PBOC finds new loosening measures, among which, lower bank reserve requirements are expected this year. But the danger lies in a possible a loss of confidence in the yuan, in which case new liquidity may just facilitate more capital outflows. Such a scenario would make it more likely that China would have to “go Swiss” and also let its currency loose. Brokerdealer.com blog update courtesy of William Watts from MarketWatch. Brokerdealers around the world were shocked after the Swiss National Bank unexpectedly announced on Thursday that they would be scrapping a three-year-old cap on the franc. 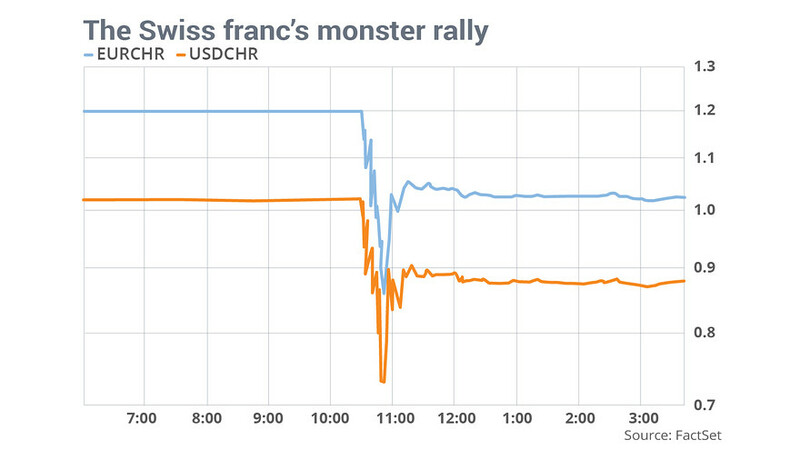 As a result, it sent the currency soaring against the euro while stocks plunged out of fear. Although the market has seemed to bounce back caution should still be taken. Don’t be too quick to look past the turmoil that swept global financial markets after Switzerland’s central bank unexpectedly scrapped a cap on the value of its currency versus the euro. Needless to say, the Swiss franc, which had long been held down by the Swiss National Bank’s controversial cap, exploded to the upside. 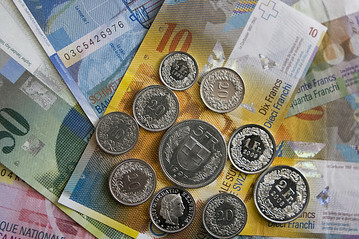 The euro EURCHF, +0.66% is down 15% and the U.S. dollar USDCHF, +1.69% remains down nearly 14% versus the so-called Swissie after having plunged even further in the immediate aftermath of the move. Since the Swiss National Bank had given no indication it was set to move — indeed, it had previously said it would defend the euro/Swiss franc currency floor with the “utmost determination” — investors were holding large dollar/Swiss franc and euro/Swiss franc long positions, noted George Saravelos, currency strategist at Deutsche Bank, in a note. As a result, the moves Thursday likely resulted in some big losses on investor portfolios holding those positions, he said. “This effectively serves as a large VaR [value-at-risk] shock to the market, at a time when investors were already sensitive to poor [profit-and-loss] performance for the year,” Saravelos wrote. The Wall Street Journal reported that Goldman Sachs on Thursday closed what had previously been one of its top trade recommendations for 2015: shorting the Swiss franc versus the Swedish krona SEKCHF, +1.26% after the franc jumped as much as 14% on the day versus its Swedish counterpart..
Douglas Borthwick, managing director at Chapdelaine Foreign Exchange, said forex participants are bracing for aftershocks. The Swiss National Bank’s move serves to underline the theme that volatility is back and here to stay. For U.S. companies, trade exposure to Switzerland is small. And that means the direct impact is likely to be more of a ripple than a wave, said Wouter Sturkenboom, senior investment strategist at Russell Investments in London. But the turmoil that followed the decision shows that markets are vulnerable to shifts by central banks which have largely been on hold since implementing a range of extraordinary measures in the aftermath of the financial crisis, he said. “It is adding to this general disquiet in markets that things are volatile and things are changing and central banks are changing,” Sturkenboom said in a phone interview. “I think that’s maybe the underlying cause [for the volatility in U.S. stocks], especially when you’ve had such a good run; valuations in the U.S. are stretched and expensive,” he said. Investors will also likely keep an eye on European banks exposed to central and Eastern Europe. Before 2008, households in several countries in the region, particularly Hungary and Poland, took out mortgages denominated in Swiss francs, attracted by low rates, noted William Jackson, senior emerging markets economist at Capital Economics. Those households got a shock in 2008-09 and in 2011 when the franc rose, boosting debt servicing costs. Another 15% jump in the franc against most Central and Eastern European currencies Thursday morning could lead to further worries, Jackson said, though he argued that the situation appears much more manageable than in the past. In Hungary, a law allows households to convert foreign-currency mortgages into forint-denominated mortgages at the exchange rate that prevailed in 2014, Jackson notes, while in Poland, the Swiss franc lending was restricted to higher quality borrowers.